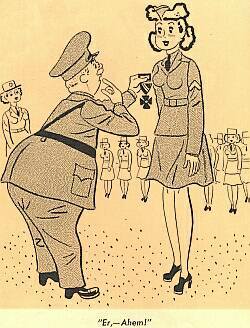 The Army awarded eligible WAC members with medals and citations acknowledging performance of duty during WWII. WAC Director Oveta Culp Hobby received the Distinguished Service Medal as the first woman to be so honored, in 1945. 3 WAC members received the Air Medal. 10 WAC members received the Soldier's Medal for heroic actions under non-combat circumstances. 16 WAC members received the Purple Heart, for being injured during enemy action (most of these injuries were caused by exploding V-1 bombs while serving in or around London). 62 WAC members received the Legion of Merit, awarded for exceptionally meritorious conduct in the performance of duty. 565 WAC members received the Bronze Star for meritorious service overseas. At least 657 WAC members received performance-based medals and citations at the end of the war, but more medals were awarded through the years as paperwork was processed during the postwar era. Below is a list of decorations that WAC personnel could receive for their service generally and for service in campaigns during WWII. .
- the Women's Army Auxiliary Corps (WAAC) between 10 July 1942 and 31 August 1943. - the Women's Army Corps (WAC) between 1 September 1943 and 2 September 1945. The ribbon colors are the branch colors of the Women’s Army Corps.